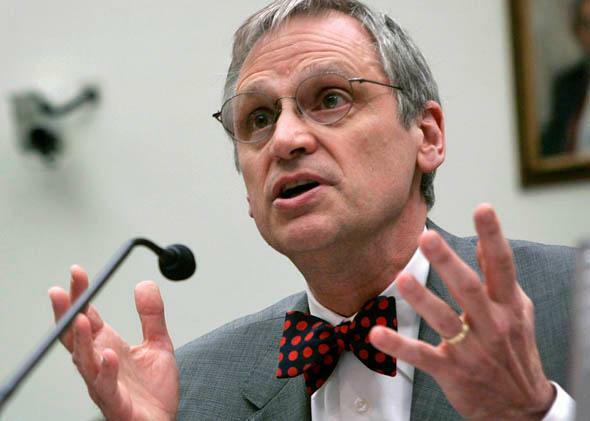 Blumenauer gasoline tax hike: Oregon congressman wants higher fuel taxes, and he’s right. Earl Blumenauer stands up for the best, least popular idea in politics. Rep. Earl Blumenauer (D-Ore.) testifies during a hearing before the House Foreign Affairs Committee in 2007 on Capitol Hill in Washington. Back in 1994, the cheapest Mac laptop on the market cost more than $1,600. On the other hand, a dozen eggs were less than $1, a gallon of milk was $2.88, and a gallon of gas could be yours for just $1.11. Of that, 18.4 cents were the federal tax on gasoline. Today, of course, everything’s different. You can get a Mac laptop for under a grand, but that milk will cost you about $3.40, and gasoline has almost tripled in price to $3.28 a gallon. But one thing hasn’t changed. The federal gas tax is still right where she was at 18.4 cents per gallon. Legislators haven’t raised it since 1993, and because they neglected to index it to inflation, the tax has lost more than a third of its real value in the ensuing two decades. Rep. Earl Blumenauer, Democrat of Oregon—who represents the Portland area and is best known as Capitol Hill’s leading bicycling advocate—wants to change that. Last week, he introduced a bill to phase-in a 15-cent hike in the gas tax, followed by an indexing of the tax to inflation. The idea is a total nonstarter in Congress and politically toxic to boot. Even bothering to discuss it is somewhere between pointless and insane. It’s manna from heaven for Republicans who’ve been on the defensive over taxing the rich and would love to shift the conversation to Blumenauer’s plot to make the middle class pay more at the pump. It also happens to be a great idea. Gasoline, you see, is very useful as a fuel for automobiles, but it also causes quite a bit of pollution when you burn it. Some of this, of course, is the carbon dioxide pollution that contributes to the greenhouse effect and the global threat of climate change. But a lot of it relates to other kinds of dirty particulate matter, nitrogen dioxide, and ozone that lead to drastically higher rates of asthma for kids who grow up near highways, for example. Burning gasoline by driving your car also imposes nonecological external costs. Bored kids cruising around in circles just to get out of the house and people taking extra trips to the grocery store rather than planning in advance take up space on the road, thus slowing everyone else down. And every additional vehicle-mile driven increases the chances that you’ll collide with somebody else, killing or injuring him. In a useful 2007 paper, Ian Parry, Margaret Walls, and Winston Harrington concluded that the full social cost of burning a gallon of gasoline is a staggering $2.10—far, far higher than what even Blumenauer would charge. Most strikingly, they calculated that the local pollution cost alone—that is, the cost if you completely ignore climate change, traffic congestion, and road deaths—is 42 cents. Those costs are one of the reasons conservative economist Gregory Mankiw has proposed a gas tax hike of up to a dollar. But Mankiw also offers another important reason, relating to what’s called “tax incidence.” Formally speaking, the gas tax is paid for by gasoline buyers. But any time you tax anything, some of the real cost is borne by producers, who sell less stuff now that the price is higher. Except nobody really produces oil—it’s just sitting around in the ground. So slowing the pace of oil extraction doesn’t reduce long-term national wealth in the way that inhibiting other economic activities do—the oil is still around for later use. But what makes Blumenauer’s legislation even better than your typical wonk policy dream is that it’s pretty clear we have to do something about the gas tax situation. Gas tax revenue, you see, has been falling pretty sharply in recent years. Americans are driving less than they used to, and the miles we do drive are increasingly likely to be in a fuel-efficient hybrid or diesel vehicle. Electric vehicles’ market share is tiny but seems overwhelmingly likely to increase in years to come. And even conventional vehicles are getting more efficient as the fine points of engine design and sturdy lightweight materials steadily improve. Increased fuel efficiency is mostly good news. The problem is that the government funds transportation infrastructure largely out of fuel taxes, so falling gasoline consumption creates a problem for the budget. That’s led various politicians to propose such things as a tax on hybrid and electric cars or a brand-new tax on vehicle miles traveled. These aren’t absolutely horrible ideas judged in isolation. But if you’re going to raise a driving-related tax, why not raise the one kind of tax that also reduces pollution and makes lucky oil barons share in the burden? Gasoline taxes’ unpopularity with the voters is one reason, of course, but there’s no reason to think people would like a vehicle miles traveled tax or hybrid car tax any better. Given a necessarily thorny political situation, sometimes the best option is just to do the right thing.